Observatory Mt. Stromlo - Universe Galaxies And Stars Section. Australia's Mt. 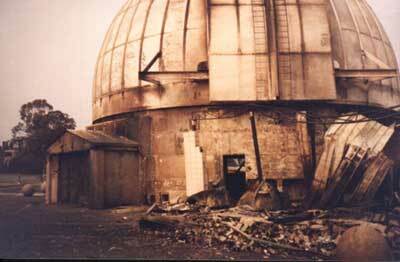 Stromlo observatory Opens Up Again. A new page is set to be written in Australian scientific history with the establishment of new buildings at Mt Stromlo Observatory. Staff at the ANU Research School of astronomy and Astrophysics are celebrating not just the commencement of the $36 million first stage of the historic observatory’s redevelopment; but also the announcement that the site will re-open to the public on Saturday, 30 October 2004, with self-guided tours of the site and a night sky viewing program. "After getting an average of 70,000 visitors per year and conducting some of the world’s leading astronomical research from Mt Stromlo, the fires of January 2003 were a huge blow not just for our staff, but for the global astronomical community," the Research School’s Director, Professor Penny Sackett, said. "Now, 21 months after the fire, it is really exciting to commence construction of the first stage of the new Stromlo. This stage will involve the construction of an Advanced Instrumentation Technology Centre, the rebuild of a destroyed multi-million dollar optical instrument and the construction of a new telescope. Plans for the second stage of redevelopment are already well advanced. "A huge volume of work has preceded this moment. Plans for each building have had to comply with heritage considerations and with much data about the history of the site lost in the fires, that process has taken quite a lot of time. "We are also hopeful that insurance issues will be settled soon, enabling us to plan for the full redevelopment of the Observatory. "It is vital to recognise that despite the fires and subsequent delays in reconstruction, Mt Stromlo has continued to be a major international centre for astronomical research. Our staff have used Telescopes at the ANU Siding Spring Observatory near Coonabarabran and other Telescopes around the world for their research and continue to make some of the most exciting discoveries in astronomy and astrophysics." The 2003 fires destroyed a superbly-equipped workshop complex, seven houses, five Telescopes and a historic administration building. Demolition of parts of several buildings was allowed to commence in August after permission was granted by the Department of Environment and Heritage and the National Capital Authority, pending final approval of the redevelopment plan. The demolition process has now made the site safe for public access. "It is fantastic to once more be able to welcome the public back to Mt Stromlo. We weren’t able to make the site safe for public visits until demolition and reconstruction plans were approved. The commencement of our night viewing program on Saturday marks an important milestone in our recovery, allowing the public to experience some of the same excitement about the universe that we feel in our daily work at the Observatory." Funding for the redevelopment will come from a Federal Government grant, donations and partial payments from insurance companies. Money donated by the public will be used to fund domes that will house small Telescopes for public viewing of the night sky, one of which is a historic telescope salvaged from the heritage Commonwealth Solar Observatory building. · The Advanced Instrumentation and Technology Centre, which will replace the workshops destroyed in the blaze, offering expanded design, manufacturing and testing capabilities for precision optical instruments, opportunities for higher degree student participation in technical projects, and a research and development program focusing on Extremely Large Telescopes. · The world’s fastest sky-mapping telescope, the SkyMapper, to be installed at the ANU Siding Spring Observatory, but controlled from Mt Stromlo through an ultra-fast broadband link. SkyMapper will complete the first digital all-sky map of the Southern Sky. · The $6 million Near-infrared Integral-Field Spectrograph, being rebuilt for the Gemini Observatory in Hawaii in partnership with Auspace. Construction of Stage Two will commence as further insurance money is received in compensation for the fires. ANU is still in active discussions with three insurers over full payment for damage of Mt Stromlo. Mt Stromlo will be open from 10am-3pm on Saturday 30 October and 10am-5pm on Sunday 31 October. Mt Stromlo will then open to the public every Wednesday to Sunday between 10am-5pm. Saturday night sky viewing (Saturday Stargazing) will commence on Saturday 30 October. Bookings essential, call Natalie T: 02 6125 0232.